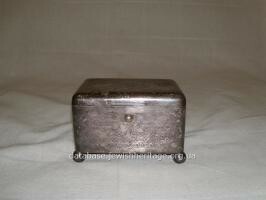 Metal etrog box for Sukkot holiday. Metal box of rectangular shape with rounded edges is decorated with embossed floral-geometric pattern. Legs of the box are decorated in the form of balls. The box has not handles and opens by pressing of the round metal button. Transferred to the museum as a part of the collection of O. Ilyin for permanent storage. 1994. Etrog which is one of the four species of plants and used during the Sukkot holidayis traditionally wrapped in silk soft cloth and put in a box. For ages Jews greatly valued and took care of etrog, keeping it in a box with cotton wool inside to avoid damage. In order to express the respect to etrog and love to commandment the box was decorated especially beautiful with ornaments and religious inscriptions. Stamp of the firm "Norblin".